To move our ideas forward, share our developments and bolster the implementation of new projects, we work alongside the standard institutions and experts in their field. NEYRET is a member of the Centre National de Référence on RFID. Created in 2008 by the Ministry for the Economy, Industry and Digital Affairs, the Centre National de Référence RFID is aimed at facilitating the adoption and appropriation of contactless technologies (RFID and NFC). Its objective is to encourage the roll-out of RFID, NFC and contactless solutions and to develop partnerships between solution providers, users, research laboratories and institutions. The Cité du design of Saint Etienne focuses its activities around strong and cross-cutting themes to drive the democratisation of design. Whether design improves uses and lifestyles, optimises the use of energy, supports changes in housing or facilitates the furthering of healthcare and mobility, it arouses the thought process. The cité du design is a think tank on practices, requirements and uses and shows how design impacts the emergence of new dynamics within contemporary territories, whether social, economic, political or cultural. 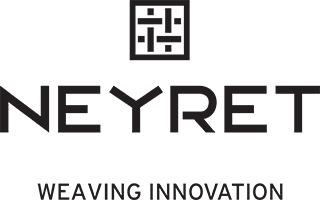 Neyret is a member of the Bpifrance Excellence community which rounds up over 3,000 innovative businesses.